After three weeks I continue to be fascinated by the Chicago L system. 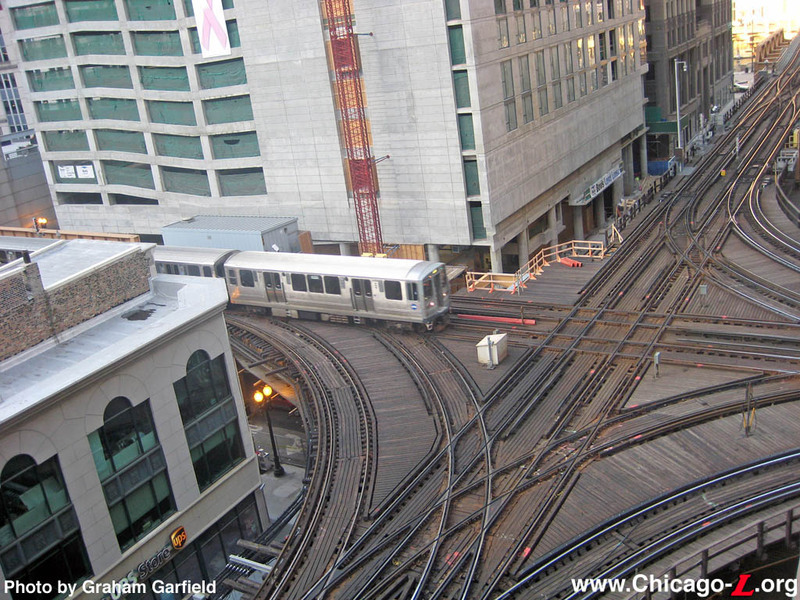 The downtown area is known as "The Loop" because all of the trains* meet there. And while it's not unusual for a large old city to have a radial rail system, what is unique is that four of the six main lines circle the downtown on an elevated alignment known as The Loop. This type of infrastructure existed in most large American cities a century ago but remains in only a handful of places, with Chicago probably being the only city with elevated tracks still operating downtown (although some cities are building new elevated light rail lines). The Loop is a work of art but also a minor operational miracle. Each side of the rectangle has only two tracks with closely spaced stations. The CTA Green Line serves only two sides as it travels both west and south, while the Pink, Orange & Brown Lines (and the Purple Line in rush hours) use the Loop to turn around before returning to their other terminus. The other lines (Red, Blue) pass under the Loop in two parallel subway tunnels and passengers can make the long vertical trip to transfer at Jackson or Lake. This picture (courtesy of Chicago L user Graham Garfield) shows Green or Pink Line train entering the Loop at its northwest junction by traveling eastbound on Lake Street. In typical operation, trains approach the junction, wait for a signal, then cross oncoming traffic just like a car making a left turn on the street below. There is no space to layover and nowhere to pass a disable train, so a delay or broken switch can be a nightmare. Sometimes trains are sent around the loop a second time if an open drawbridge ahead prevents a train from exiting here. When I say that just getting the buses and trains back to the garage at the end of the day is a feat in itself, this is the kind of stuff I'm talking. However, it's really cool looking into the buildings and out over the city when the turns makes its very tight turns. * For this post I mean only rapid transit (subway/metro) trains. Because the transit systems were built be competing companies, as in most large cities, the regional rail and bus stations are located a short walk from the Loop. Also for the same reason, there are 12 regional rail lines operating from four different terminals, and intercity buses stop at a different terminal. P. S. Have you been following me on Facebook and Twitter? Read my micro thoughts and some of my favorite of micro transport posts/tweets by others.